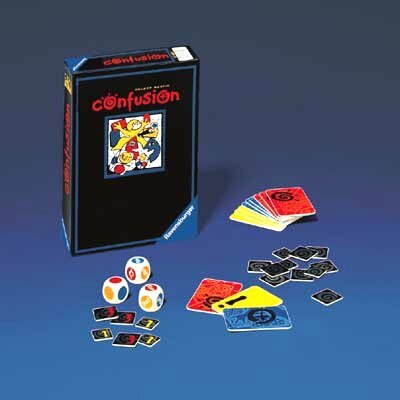 A very confusing game, Confusion. There are 3 dice; Color dice, Word dice and an Action dice. They each have a background color and some other piece of information. If the word on the word dice and the color on the color dice don't match be the first to throw out a card of the color that is missing (there are only 3 colors total). If they do match proform the action on the action dice. Collect the most points by not being last or freezing up. There is also a variant that complicates things further.